When your accounting program starts emailing you, you pay attention! Since we switched from Aweber and Mamut CRM to Octane - which does our both email and follow-up marketing - I receive an email every morning telling me which follow-up letters to print, which prospects to custom email or to call in regards of an outstanding quotation. An online program as "task-master" where ever you are (and have internet/email access of course). 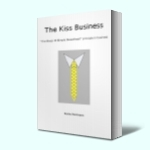 I'm also used to receiving emails from my accountant on what to do next on the business, I hope your's does this too. But now even my accounting program is emailing me! In an earlier post I explained why our existing accounting and -ecommerce desktop software needed replacement. The new Ecwid e-commerce widget was quickly found and doing what it is supposed to be doing: easy navigation for our online shoppers with a simple and straight forward check-out process (offering various payment options too). Next up was the accounting part. The search concentrated on UK based SaaS (Software as a Service) software, eliminating waiting time on support tickets if and when needed (5 - 8 hours time difference between UK and USA is half a days work missed - been there, waited that long). Having some experience with Liberty accounting I discarded that program - not flexible enough for my standard/methods of bookkeeping, project management and financial reporting (yes, we are a small company but facts and figures does help you to know where you stand and where you want to go, so rather important). Had a look at Clearbooks but like Liberty it has a fixed fee for limit on transactions then additional costs when you go over your "llimit", which IMHO restricts effective bookkeeping in service of financial management. So I in the end I selected Kashflow (found this program through a tweet from Duane Jackson, Kashflow's founder, when I tweeted about Clearbooks - now that's a clever and effective use of twitter). Liked what I saw and read, specially the API link between Paypal and the online software, plus one fixed fee per month for everyone with no nonsense about limiting the number of transactions. Free trial available for 2 months - which I took. After only 1 week I decided to open an account - free trial continues, I won't be billed until this period has finished. Kashflow comes with many (simple) features which in many cases are real benefits for those, like me, who consider bookkeeping an essential and important part of running your business in such a way that working in the business becomes working on the business. Customer details included the source this contact came from (with the additional "feature" of setting a cost per source - enabling you to finally discover which 50% of marketing expenditure works (sure you all know the famous quote about knowing 50% or your marketing budget works, but you don't know which 50%), reports of income per month or any period you want to see, per source, drilling down to client level. Like the first ever bookkeeping program I selected when we first arrived in the UK (there is a slight difference in Dutch or English bookkeeping methods, won't go into that here) MYOB, Kashflow trusts its users to know what they are doing and allows editing of bookings unlike other - big name - software programs. When MYOB was taken over by Mamut we added the accounting package to the Mamut CRM - only to discover that now some beneficial items of the CRM program no longer worked. The only solutions was to upgrade again to an even higher package (Enterprice 3) to resolve this problem. Strange but true. Mamut accounting did not have the option of editing any of the bookings which meant credit notes, correction journals etc. Finally with the last upgrade this was sorted: only it seemed Mamut is so afraid business owners do not know what they are doing that every time you want to correct/edit a booking (only very limited corrections also) you had to enter your user name and password again, even when you - like me - are the only administrator in the program. For every single correction! Come on Mamut - we're no naughty kids, we are business owners! Anyway, those days are now gone and I'm quite happy with the Kashflow online software. When the trial period is over we'll be paying £ 14.99 ex VAT per month, plus £8.45 per month for the Paypal imports. There is a second option for Papal, importing income and outcome once a week for £2.99 a month but I decided to compare "costs" versus time to be spent on adding known data - already online - to another program manually. Since the switch from Mamut ecommerce to Ecwid ecommerce there has been a significant increase in online orders being paid through Paypal express or normal Paypal checkout. More orders also mean more often booking the courier (also online, great company) which we pay by Paypal. All sales, purchase and transfer details are collected by Kashflow once every hour through the Paypal API, creating new customers or suppliers where needed and adding the invoice, purchase order to the contacts. IMHO this saves me more in time than the £ 8.45 represents. Of course, there are - as with every program - minor issues. Already some of my questions/querries, suggestions submitted through the excellent and quick to respond support desk (who seem to work during the evenings and weekends!) have been added to the to-do-list of the development team. Could be that I have a different way of looking at bookkeeping than others, but nice to know Kashflow appreciates involvement of their clients. One of the issues I have are the product codes: at the moment I have to create a product code in both the "Sales-Type (as Kashflow renamed the nominal accounts group for turnover) as well as to the "Outgoing Types" (as Kashflow renamed the nominal code groups for costs of sales and expenditures). Why not one product code tab which has a sales type and an outgoing type as default value? I'm adding the code products now as and when needed. Repeat invoices and bank transactions can also be created, only not repeat journals. You can create journal templates though, so perhaps turning the templates into repeat journals once o month, quarter etc will be possible in the near future too. I hope so. The software works so effective the "books" are now up to date every day, more and more purchases are added to the automated repeat purchase list, so next month I'll have even fewer items to book. And the normal financial management reports I create every 3 months for myself and my team, including our accountant, are already "in there" with one click of a button. So top marks and the Kiss Award for Kashflow, makes running your business easier with in-depth instant details on how you're doing. And of course sending me early morning emails telling me which suppliers need paying and which clients should pay us today. (Side-note on Mamut: I've now been told that because we're not renewing the annual service agreement fee I will loose access to the desktop software program the minute the existing agreement ends. A desktop program - not online "hire" of server space. When I argued I'd paid for the actual program itself and the service agreement is for updates and support all I hear is: it is mentioned in the licence agreement. Well, the person who sold me the first ever Mamut product (CRM & Sales) never told me that. Our existing webshop - implemented 3 years ago as substitute for Actinic - is an integrated part of our Accounting package from Mamut (Enterprise version). Then fitting the bill as a modern Ecommerce solution, now - compared with the newer cloud computing solutions all around us - more and more sluggish and lately even frustratingly out of date. As always, you try to "hang-on" as best as possible, and kind of shrug off the restrictions the program keeps putting in your way to add versatility and improvements to the online shopping experience of modern online shoppers. But there comes a moment when you decide: enough is enough, we need another solution. Even if that means adding a bit more work to the bookkeeping by missing the automagicall link between online order and sales ledger. Searching the internet for a better solution for us brought, of course, a multitude of options. Some fortunately offer a trial webshop or a trial period. Dividing time between normal tasks, other marketing projects and testing these options does tend to make one impatient. But help was at hand by means of a recent blog post by my online friend Martin Malden. And I completely agree with Martin: it's superb (and free for the first 100 products you have in your "shop"). Opening an account is dead easy, you can even log in with an existing google account. It's more than a "shop" - it's the ultimate Ecommerce multiple outlet option. You'll notice I keep placing the word shop between quotes - because it's more than just an online shop where you send your prospect to to do their shopping. Imagine the following true facts of the last week: there's no promotion of the new "shop" yet, I've not even linked to it from our main website but already have managed to receive an order every single day! Why and how? This single product you can buy straight of its landing page - a webpage from our main website dedicated only to our cast iron buffing block, nothing more nothing less. Before Ecwid there was a link to our existing webshop where this product is listed among other maintenance tools we sell. With Ecwid you can simply copy the html code of any product in your "shop" and paste it in any other webpage, blogpost etc. Imagine what this does for our other landing pages (simple DIY guides) - they too are already attracting orders. The minute a visitor adds one of the product to the bag, the actual shopping bag appears. Try it for yourself if you like and then "open the bag". Continue Shopping. This brings you, without leaving the page you were on, in the actual complete Ecommerce shop where you can fill your shopping bag with other products. Go on, give it a try. Have a browse! The actual Ecommerce "shop" I call the "storage house", the back end of the webshop. There you admin the products, the prices, the product images, the Egoods files, the categories (and one product can be attached to more than one category), the delivery costs, the payment options, the outgoing emails to your new (or existing) clients etc etc etc. The Front End of your webshop can be anywhere. Multiple outlets with either the complete range, one single category or even one single product. It did take me more than 5 minutes to set it up, and it still does not replace our existing Mamut webshop, but we're getting there. Once all the categories are filled we'll start to redirect everyone to our new Ecommerce solution. And in the meantime the landing pages will no doubt continue to bring in new orders. Martin, thanks again for the tip. And as for Ecwid - I grant them the Kiss Award. We use our FAQ blog, our website, PDF files, AWeber autoresponder and printed reports to 'publish' this content. And then I'm not even talking about my 'second career' over at "1 Plus 1 Makes 3", where I write about Web marketing tools for Small Businesses. The programs I used before to create this content varied from MS Word to writing 'live' online in the blog platforms or autoresponder software. Copy/pasting directly from Word can create havoc with formatting, so frequently when I have existing content in one program I have to copy/paste it to notepad, then into the other software and 're-format'. Not so handy. The real beauty of ScreenSteps Pro (desktop) is that you only have to create your content once and are given at least 3 options to publish your content: PDF, blog-post (all main blog platforms covered) and HTML-pages. For instance one 'lesson' in a manual can be exported as blog-post where the whole manual can also be 'exported' as PDF file. If for one reason or the other your content needs editing, the changed document/blog-post/html-page will be 'exported' to your selected medium again, overwriting the 'old' one. The snapshot (right) of the export function in ScreenSteps Pro shows a 4 method - ScreenSteps Live. ScreenSteps Live is an additional product with the Desktop that allows you to host your content in "manuals" on the ScreenSteps Live server. And a manual contain 'lessons'. Now, "lessons" can be interpreted in many ways. For small businesses who answer questions from prospect/clients - the customer service or technical department comes to mind - it can be 'instructions of use', how to.. documentation, up to a whole list of FAQs. For training businesses - software training up to English grammar training - a lesson can be just that: a lesson in the study. Imagine your customer service department having to answer the same question over and over again. Wouldn't it be nice, practical, effective, efficient and evidence of good customer care to simply direct the client to that specific lesson online? It is proven that correct and accurate documentation available to clients reduces the number of times your customer service department is called again by the same client still struggling with the same question. Last week I've taken the step to add ScreenSteps Live to my SS Desktop, and today Blue Mango launched the ScreenSteps 2.5 Candidate - with more features, benefits and ease of use. Over at 1 Plus 1 Makes 3 I'm in the process of creating the Best AWeber Strategies and Tactics for Small Businesses and a pre-view of some of the tactics can be viewed on ScreenSteps Live by those who registered for my pre-launch news. Both ScreenSteps Pro and ScreenSteps Live receive my very own K.i.S.S. award - it makes my live as 'web marketing toolbox maker' so much easier! What is proper marketing in fact? Effective, proper marketing goes one step further: it gets that message across in the most simple way. How often do you receive long sales letters that indeed recognises one of the problems you might have (and which business hasn't problems or 'pains'), puts forward a solution for that problem (with a ongoing list of features etc) and ends with a promise of plenty benefits for you. One of the problems most business owners have is: we're all pressed for time. Having to read through a whole sales letter to find out exactly what the solution and those benefits are takes time (I know, there are some really good long sales letters out there that can capture your interest from the word go - but they are rare and more exception than rule, no matter how long or often you study everything from the copywriters-gang). 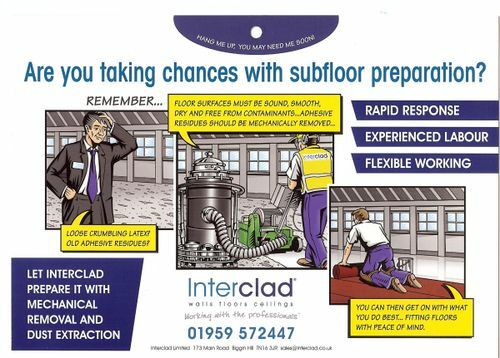 I took two actions: I called them to ask if they also solve a specific underfloor problem some of our clients have (removing that terrible tacky, sticky old fashion bitumen adhesive) - which they do - and pinned the card to a wall in our 'office' part of the showroom. We might need it soon! And of course the marketing department/marketing bureau (whoever they might be) receives my K.I.S.S.-award. Beginning last month I wrote a post on Meta Tags: writing for Google ranking or Prospects? Too many web-designers only focus on the first part, while most copy-writers focus on the last. It should be a perfect match, like a marriage or come to think of it like the title of my dynamic website (aka blog) number 7: 1 plus 1 makes 3. Two weeks ago Jon Wuebben (Custom Copywriting) asked me if he could send me his book to show me that there are writers and marketers around who really know what it is all about. And who am I to miss out on an opportunity to learn some more? 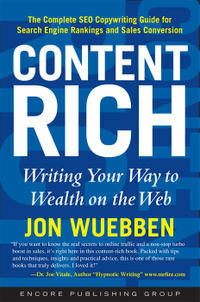 His book "Content Rich - Writing Your Way to Wealth on the Web" arrived duly and from page 1 on I was hooked! Finally someone who marriages writing for SEO and writing for Prospects in a simple way. Not just simple, but very comprehensive and almost timeless (we all know the Web can change overnight, but even that is covered in one of his chapters: The Future of SEO Copywriting - the Future is Now). The whole book is based on what I come to think of as the main principle in a successful web-presence: SEO Content should speak to Search Engines & People. And don't miss Jon's insight on 'local search': more and more qualified leads you didn't even knew you could have are using the search engines to find and visit/contact local companies - make sure they find you by following Jon's tips. As (Dutch) qualified bookkeeper 'doing-the-books' is almost second nature to me and I really took time to select that accounting package that does everything I want it to do (and preferably more). For that reason I recently switched from my trusted and reliable MYOB software to Mamut Enterprice (which integrates Customer Relationship Management, Accounting, Webshop, Sales & Purchasing and more into one simple system). But that's me - facts, figures and statistics 'nut' (or 'freak' as my partner regularly compliments me), 99 out of the 100 small business, self-employed traders or service providers will be more than happy with a less complicated, user-friendly simple piece of software that replaces the 'old-fashioned' pencil and paper cash-book, saving time and money. And time and money are the two main things you as a starting business, a small business owner or self-employed trader can't have enough of for doing the normal day-to-day work, be it on the job or sourcing new clients. But your accountant, the Inland Revenue and for some the 'VAT-man' come knocking at least once a year to see and check the results of your normal day-to-day work. Our own modern accountant has, on request of many of his clients, designed the Rapid Cash Accounting Package - as simple as 1, 2, 3, 4. But with the Rapid Cash Accounting Package that's all you have to do! Fill in the 4 W's per transaction and the program does the rest. It calculates the totals of every column, from bank balance to income or cost category after every transaction. And at the end of every month it transfers your bank, cash and card balance automagically to the next one - plus at any moment in time you can check your year-to-date results. Once again: all you have to do is fill in the 4 W's per transaction - as simple as 1, 2, 3, 4. My (volunteer) life as treasure of the BNI-Ashford chapter was made very easy with an earlier version of the program, the revised 2008 version is updated with even more benefits for the user. So hurry before the special re-launch offer runs out - and to be honest even £ 67,95 for a program like this is worth every penny of it. In my last post I talked about team work, essential for any business, even or especially if your business 'only' exist of 1 or 2 employees. Prior to my next post on this subject I want to point your attention to a brand new book, so brand new it isn't even available in any shop or on Amazon! When you establish a outstanding team around you one of the best ongoing result will be 'the looking out for each other' practise: if one of the team members sees something he/she knows the other will benefit from (even if it's not related to the project your team is working on at the moment) it almost becomes a habit to point the other towards it. That's exactly what happened over a week ago. Richard C emailed me about an UK based blog about webmarketing: Ed Rivis, Web Marketing Strategy for Small Business Success. "I suddenly remembered that I meant to send you an email re Ed Rivis. His blog has become, probably only since the beginning of 2008, really good value (for people like you and me). He seems to post a blog daily now (almost too much for me to take in) but they are extremely 'educational' in content and currently very relevant to you and I. He is clearly feeding off Paul Gorman (a mutual friend / business marketing guru I know). What is very skilled is his approach to offers etc - he is very strict on the 'time frame' for responses and it seems to be working for him. His current 'special' is a .pdf download of his book - provided you've registered with him by 1st February." Which, of course, I did. And even before registering to his blog (using the AWeber web form) I picked up a very useful web marketing tip (what, how, where and why I implemented that straight away is for a later post, this one is - again! - already turning into a longer one than originally planned). Anyway, as promised by Ed Rivis last Friday at 4pm an email with password arrived in my inbox to go and download his gift to his subscribers: the PFD-version of his new book. The full version, no cutting 'cheap' corners. Downloaded it, printed it (and for my readers looking for green credentials: on the back of already used paper - I recycle) and took it home with me, all 210 pages of it. To be honest, I do think I know pretty much about Web Marketing already. I mean, last year we increased our turnover with 66% and 68% of our new clients found us through our websites! But, everything can always be made better, that's the beauty of learning. Friday evening I was already on page 129 and yesterday evening I'd finished it all. And now I have to find even more time because my head is (again) filled with ideas and new, better web marketing projects that will last me the rest of the year! b) even more focussed on - as New Customers Only based business (that's worth another post, no, make that another book) - capturing prospect details to start the conversation, utilising the surrounding software packages (like AWeber) we have even better. IMHO Ed's book is written very well, straightforward and based on the great principle: don't just read it - implement it! And he makes that very simple with excellent examples, links to software packages, websites and much more. You're too late to receive the PDF-version, that's been taken of the blog since last Saturday, but by all means subscribe to his excellent blog and start learning and earning. The physical copy will be available around 18 February on Ed's blog with a 65% discount on the official price for his blog subscribers, so what's keeping you? Trust me on this one! Marketing = about systematically selecting how and what you're communicating to whom. How and What your Brand should be Communicating and to Whom. "Like why (business) workshops should be interactive and not just a lecture filled with cliché solutions (clichés most times only suitable for specific kinds of businesses - nine times out of ten not yours)." The 'Lets talk...' workshops by Robert Craven in cooperation with Barclays fit the bill perfectly, if you are ever in the position to join in don't hesitate, just go and be prepared to work! Talking about Robert Craven and Accountants (see the above reference to my own accountant) - this week Robert published a blog-post on the very subject: I love my accountant. In his post you'll find a link to an interview he recently did - made me smile many times over! Very versatile, Robert is, and he does keeps it simple. This week we watched Gordon Ramsey's 'Kitchen Nightmares' and I must admit, in between the f**-words I do admire his knowledge, passion and drive for good quality. Gordon's programs are not for the faint-hearted, IMHO he branded the f** word (now there's a feat! ), and I think he should consider writing marketing books instead of cook-books ;-). His advice, delivered with passion, drive and based on experience is straight forward and simple - time after time. This week's (repeat) program showed a 'traditional pub' owned and run by an elderly couple, where the menu was filled with, well lets just say, dishes you wouldn't really expect in a traditional pub. Tables were 'dressed-up' as if the Queen herself was coming to dine. Earnings were down, employees 'drive' even more. "If you're stating you're a f** traditional pug, start behaving like a f** traditional pub! Don't confuse your clients with posh dishes. If you want to serve f** posh dishes, open a f** posh restaurant!" Or in other words: know your target market and be consistent in providing your target market with those products and services your target market expects from you. Gordon and the passionate employees turned the traditional pub around in one week. The pub is now famous for its traditional gravy instead of its posh dishes. "7 Reasons to use a blog for your business web-presence"
Is your tenancy deposit really protected? Shall I Clarify-it for you? Karin H. on Is your tenancy deposit really protected? Peter on Is your tenancy deposit really protected?